Mr. Alfredo M. Yao is the Chairman Emeritus of PBB. He is con-currently the Chairman of Zest-O Corporation, Semexco Marketing Corp., and Asiawide Refreshments Corp.He isthe President of Solmac Marketing Inc., Harman Foods (Phil.) Inc., and Amchem Marketing, Inc. andwas a former director of Export and Industry Bank. Mr. Yao has participated in the following seminars: Corporate Governance; AML and Risk Management, all conducted by the Pacific Management Forum and PBB; CISA for the Credit Bureau; SME Related Issues; and other CTB Related seminars. He has also attended several Philippine Chambers of Commerce &Industry (PCCI) Business Fora given by PCCI, the International Trade Organization, and the Department of Trade and Industry. Mr. Francis T. Lee was appointed Chairman of the Board on July 26, 2010 and was last re-elected as Director on May 26, 2017. Before holding the Chairmanship positionMr. Lee was first appointed as Chief Operating Officer (COO) last September 1, 2011. He was also President of the AMY Foundation - the social responsibility arm of the Yao Group of Companies, from December 8, 2003 up to December 8, 2013. An experienced banker for more than 30 years. Lee started his banking career with Pacific Bank. His career progressed as he held a number of executive positions from Senior Manager rising to Senior Vice President at the Metrobank Group from 1988 to 2000 beforejoining PBB. Mr. Lee has participated in the following seminars:Philippine Institute of Banking in 1969; Corporate Governance & Risk Management for Bank's Board of Directors at the Development Finance Institute in 2002; Team Building Workshop in 2004 at PBB; Risk Awareness Seminar in 2009 at the Pacific Management Forum; Anti Money Laundering Act Seminar at the Bangko Sentral ng Pilipinas in 2012 and in 2014; and Corporate Governance Seminar for Board of Directors on December 10, 2015. 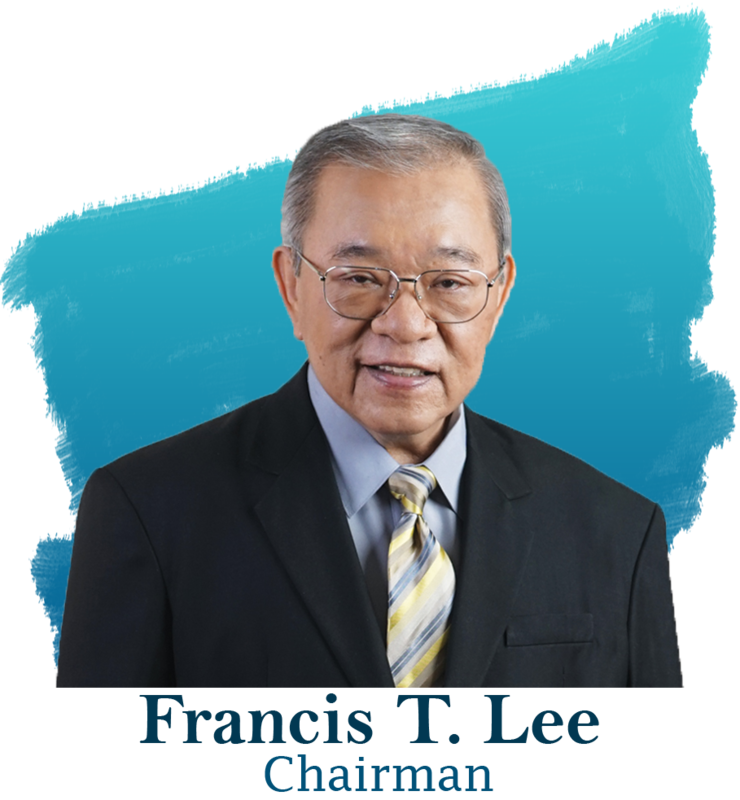 Mr. Lee studied Bachelor of Arts in Business Administration at Manuel L. Quezon University. Mr. Jeffrey S. Yao was appointed to the Board in 1999. On April 01, 2016, he assumed the position of Vice-Chairman and is currently a member of the Asset & Liability, Audit, Credit, Employee Discipline, Executive, IT Steering, Management, Manpower, Compensation & Remuneration, Remedial & Special Assets, and Risk Oversight Committee. He currently holds directorship at Asiawide Refreshments Corporation Mr. Yao has been the Chief Operating Officer (COO) of the Zest-O Corporation since 2005. Mr. Yao started his career in the food and beverage industry when he was appointed as Plant Manager at Harman Food Philippines from 1990 to 1995. He completed or has participated trainings in Basics of Trust at the Trust Institute of the Philippines in 2002; Corporate Governance & Risk Management for Bank's Board of Directors at the Development Finance Institute in 2002; Anti Money Laundering Act Seminar at the Bangko Sentral ng Pilipinas in 2014; and Distinguished Corporate Governance Speaker Series on August 24, 2015. Mr. Yao graduated from the Ateneo De Manila University with Bachelor of Science in Management Engineering degree. 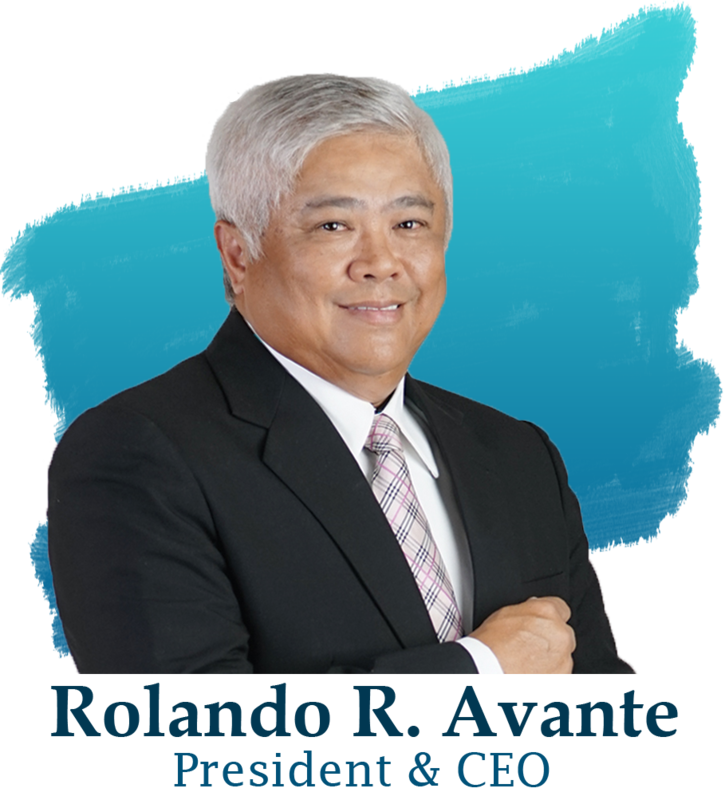 Mr. Rolando R. Avante was appointed President and Chief Executive Officer on November 2, 2011. His previous banking experience includes serving as Vice President for Local Currency Desk at City Trust Banking Corporation from 1988 to 1994; Senior Vice President & Treasurer at Urban Bank from 1994 to 1995; First Vice President for Domestic Funds Management at Philippine Commercial International Bank from 1995 to 1999; Executive Vice President & Treasurer at China Trust (PHILS.) Commercial Bank Corp. from 1999 to 2009; and Executive Vice President and Treasurer at Sterling Bank of Asia from 2009 to 2011. He was also elected President and Director at the Money Market Association of the Phil. (MART) in 1999 andat ACI Philippines in 2011. Mr. Avante graduated from the De La Salle University with Bachelor of Science degreein Commerce, major in Marketing Management, and has taken MBA units from the same university. 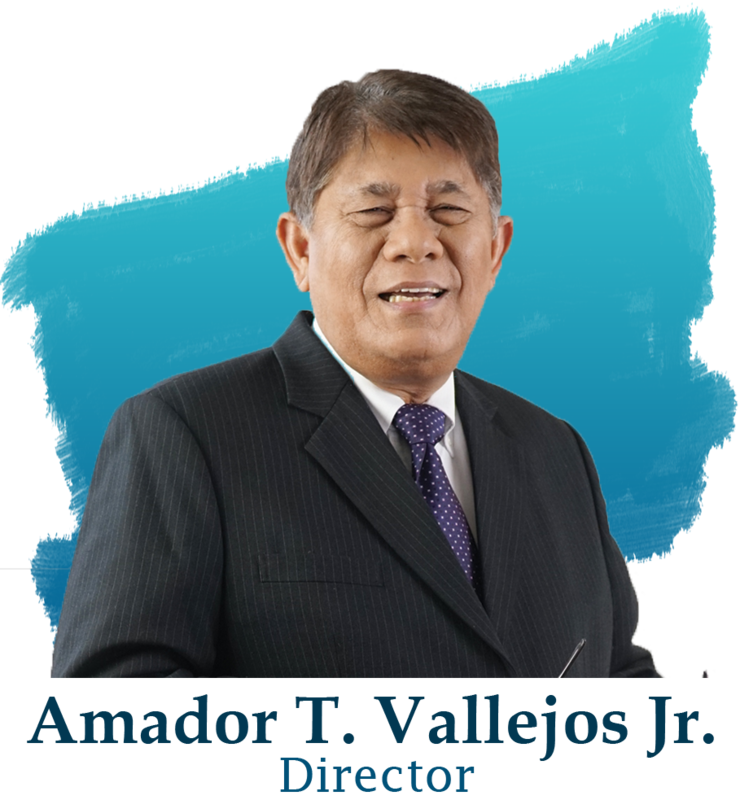 Mr. Amador T. Vallejos, Jr. was appointed to the Board on May 27, 1997 and was last re-elected as Director on May 26, 2017. Currently he is the General Manager at AMCHEM, Chairman of King of Travel, and President of SMI Development Company. 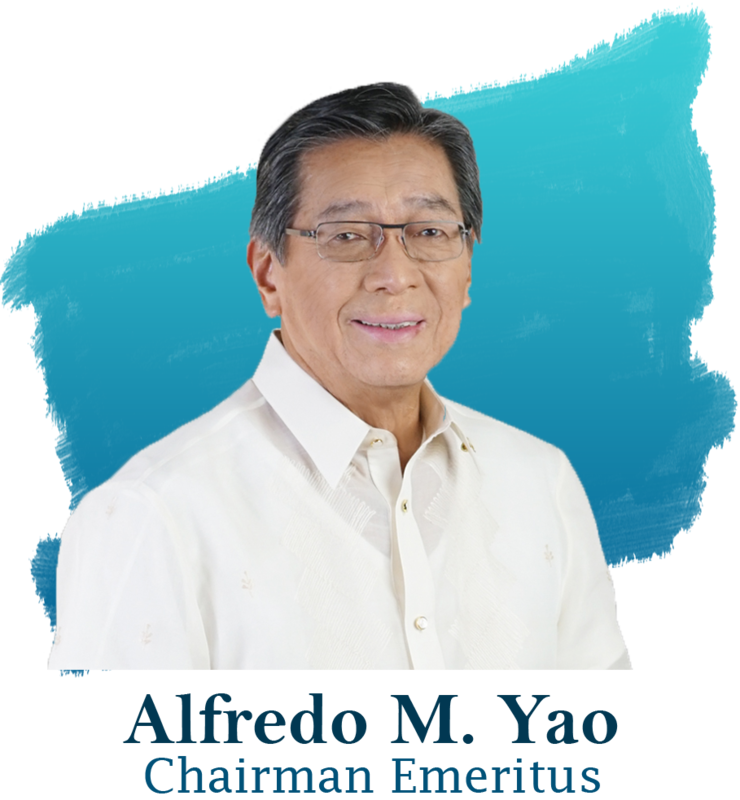 He held various directorship roles at the Philippine Association of Food Technology in 1988; Philippine Chamber of Food Manufacturer in 1989; and the Philippine Article Numbering Council in 1992. He was also a member of the Professional Risk Managers International Association (PRMIA) since 2009. From 1974 to 1976 he held the Marketing Manager position at Rockgas and transferred to Edward Keller Ltd. as the Department Manager from 1976 to 1984. Mr. Vallejos Jr. has participated in the following seminras: BAI Conference and Seminars on Technology in Banking taken in 1998 and 1999 both in BAI, USA; Corporate Governance & Risk Management for Bank's Board of Directors at the Development Finance Institute in 2002; Anti Money Laundering Act Seminar at the Bangko Sentral ng Pilipinas in 2014; Corporate Governance Seminar for Board of Directors in November and in December 2014; and Updated Guidelines on Sound Credit Risk Management on August 07, 2015. Mr. Vallejos graduated from the Ateneo De Manila University with a Bachelor of Arts in Economics degree. 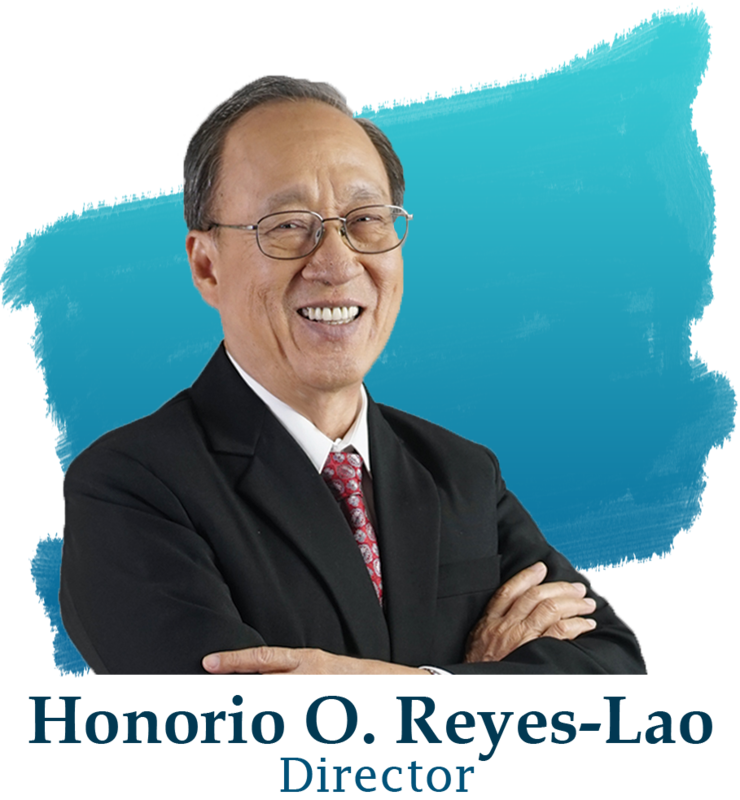 Mr. Honorio O. Reyes-Lao, was first appointed to the Board on 30 April 2010 and last re-elected as Director on May 26, 2017. A seasoned banker, he has more than 40 years of experience in corporate and investment banking, branch banking, and credit management. Mr. Reyes-Lao started his banking career at China Banking Corporation in 1973 to 2004. He served as Senior Management Consultant from 2005 to 2006 at East West Banking Corporation. Currently, he is an independent and non-executive director at the DMCI Holding Corporation. He has been a Member of the Society of Institute of Corporate Directors (ICD) Fellows since 2004. His background and trainings include Overall Banking Operations at the Philippine Institute of Banking in 1971 to 1972; Director Certification Program at the Institute of Corporate Directors (ICD) in 2004; and the AMLA Seminar at the Bangko Sentral ng Pilipinas in 2014; ASEAN Corporate Governance Conferences and Awards 2016 on November 14, 2015; Distinguished Corporate Governance Speaker Series on August 24, 2015. Mr. Lao holds a post-graduate degree, Masters in Business Management, from the Asian Institute of Management and he graduated with a double degree in Bachelor of Science in Business Administration major in Economics and Bachelor of Science in Commerce major in Accountancy from the De La Salle University. 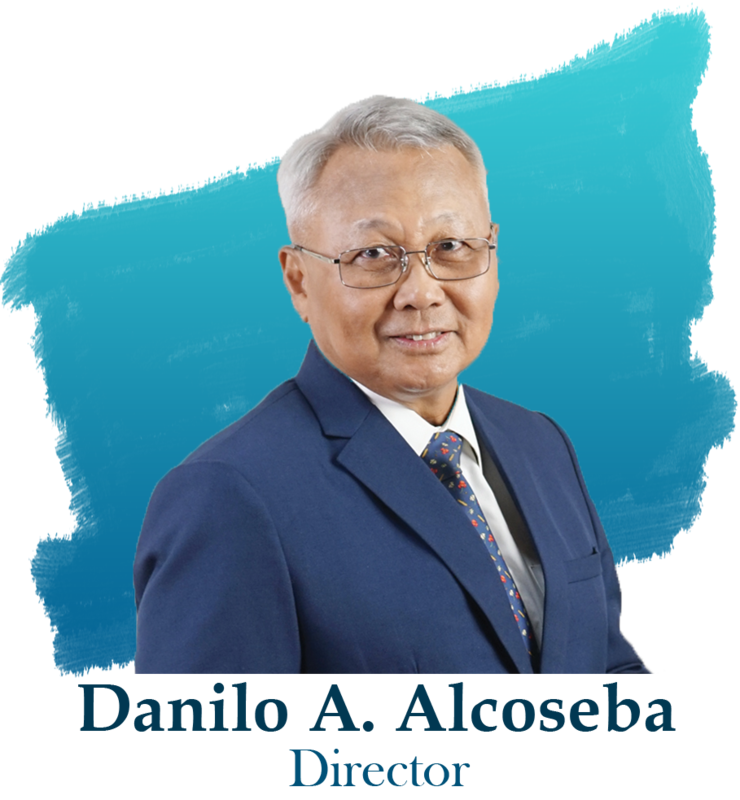 Mr. Danilo A. Alcoseba was a former President and CEO of PBB and is currently one of the members of the Bank's Board of Directors. He obtained his college degree, Bachelor of Science in Commerce Major in Accounting, at the University of San Carlos. He was also a post-graduate in Industrial Economics at the University of the Philippines in 1976. His work experience include: Branch Head at Bancom Development Bank; Cebu Branch from 1977-1979; Assistant Vice-President of Traders Royal Bank from 1979-1983; First Vice-President/Treasury Division of Boston Bank of the Philippines from 1983-1998; and Consultant at SM Investments Corporation from 2005-2007. Mr. Alcoseba also had various trainings and seminars in banking related fields notably in financial derivatives, fixed income trading, foreign exchange, investment banking, corporate governance, risk management, and international trade. 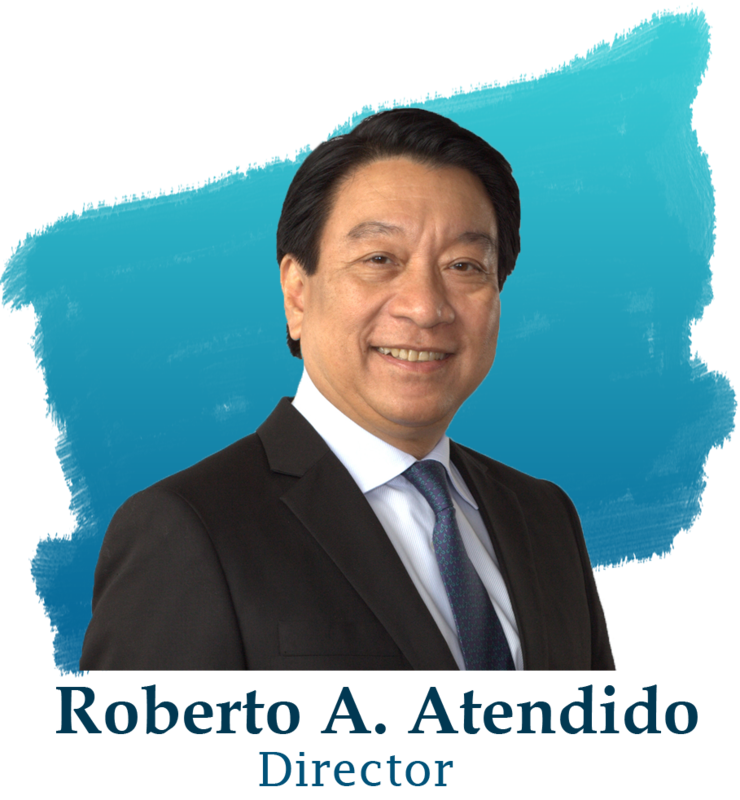 Mr. Roberto A. Atendido is a director of PBB and is a member of the Audit, Risk Management, and Corporate Governance/Nomination Committees. 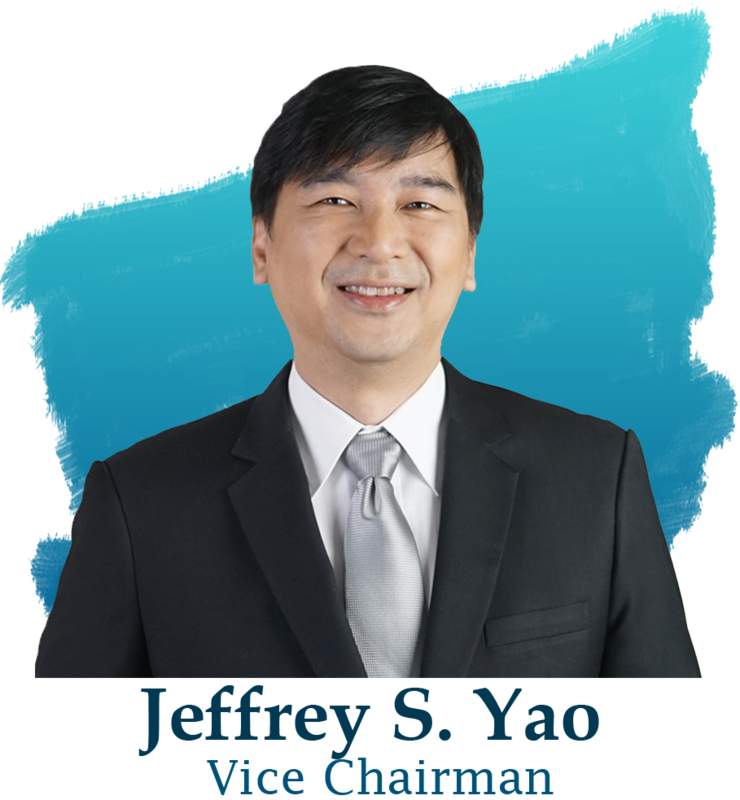 He is currently a member of the Board of Directors of Paxys Inc, PICOP Resources, Inc., Pharmarex Inc,. Ardent Property Development Corp., First Ardent Property Corp., and GEM Communications & Holding Corp. He is also the Vice Chairman of Sinag Energy Philippines, Inc. (since 2008), and the Chairman and President of Myka Advisory and Consulting Services Inc. (since 2010). Mr. Atendido graduated in 1973 from the Asian Institute of Management with a Master's in Business Management. He completed his Bachelor of Science in Management Engineering from the Ateneo de Manila University. 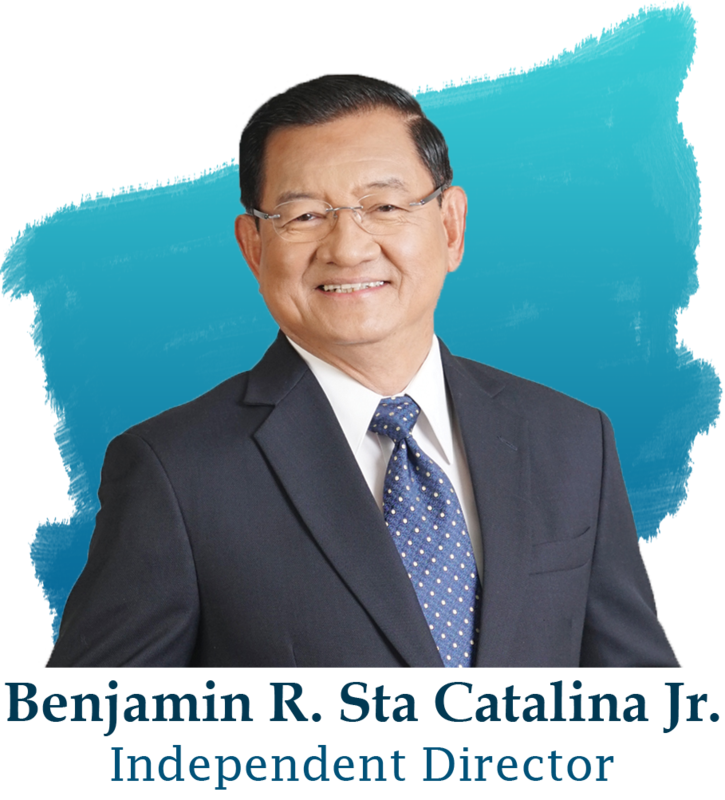 Apart from his business activities, Mr. Atendido is also active in the Brotherhood of Christian Businessmen and Professionals, a nation-wide Christian community where he served as Chairman from 2009 to 2011. 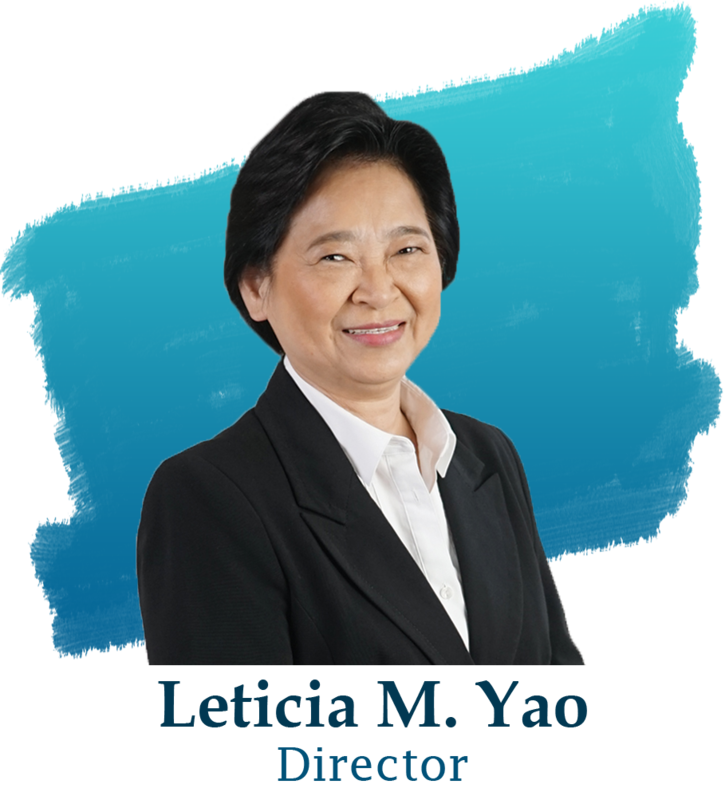 Ms. Leticia M. Yao was first appointed to the Board in 2009 and was last re-elected as Director on May 26, 2017. Ms. Yao was appointed at the United Doctors Medical Center (UDMC) as a Consultant at the Department of Medicine from 1991 to 2012. Ms. Yao has participated in the following seminars: Corporate Governance & Risk Management for Bank's Board of Directors at the Development Finance Institute in 2002 and further taken the Risk Awareness Seminar at the Pacific Management Forum in 2009. She attended the AMLA Seminar at the Bangko Sentral ng Pilipinas in 2015, Distinguished Corporate Governance Speaker Series on August 24, 2015, and Corporate Governance Seminar for Board of Directors on December 10, 2015. Ms. Leticia Yao graduated from the University of Sto. Tomas with a Bachelor of Science degree in Medical Technology then pursued her post graduate degree in Medicine also from the University of Sto. Tomas. 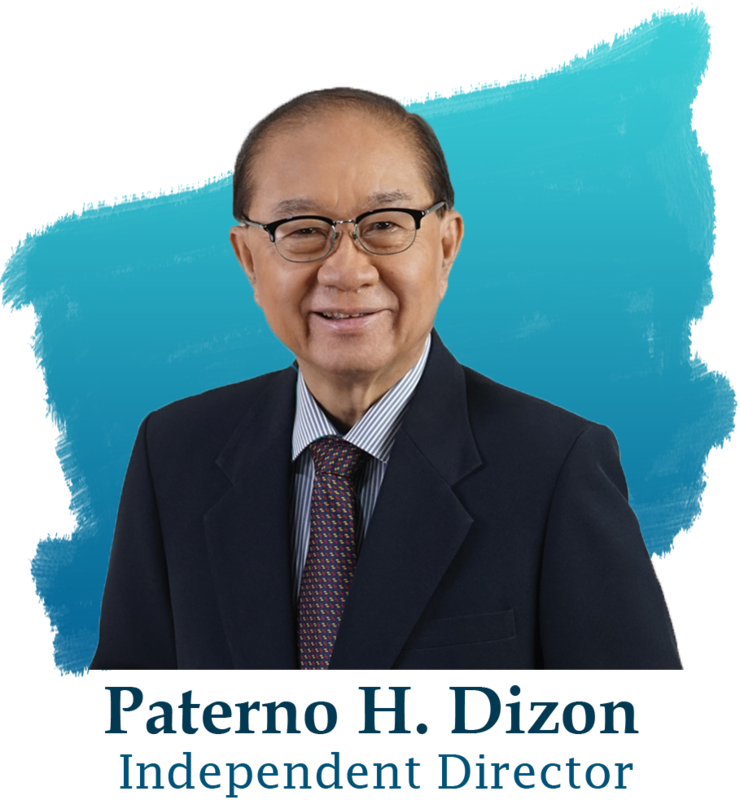 Mr. Paterno H. Dizon was first appointed as an Independent Director of the Board on April 2006 and was last re-elected as Independent Director on May 26, 2017. He had previously served as President of the following institutions: Science Park of the Phil. Inc., Cebu Light Industrial Park, Inc., and RFM Science Park of the Philippines from 1997 to 2003. Mr. Dizon held directorships at Hermosa Ecozone Development Corp. from 1997 to 2003; Export & Industry Bank from 1994 to 2006; and EIB Securities from 2004 to 2006. He served on the board of Philippine Export-Import Credit Agency from 2010 to 2012. He was elected as Chairman of the Philippine Exporters' Confederation Inc. since 1990 up to the present. He has been the President and CEO of Holy Cross College of Pampanga since 2012. Mr. Dizon has participated in the following seminars: Financial Management at SGV in 1974; Money and Banking from the Ateneo De Manila University in 1959; Corporate Governance & Risk Management for Bank's Board of Directors at the Development Finance Institute in 2002; Risk Awareness Seminar at the Pacific Management Forum in 2009; Anti Money Laundering Act Seminar at the Bangko Sentral ng Pilipinas in 2014; ASEAN Corporate Governance Conferences and Awards 2016 on November 14, 2015; and Distinguished Corporate Governance Speaker Series on August 24, 2015. Mr. Dizon holds a Bachelor of Science in Economics from the Ateneo De Manila University and a Masters in Business Administration from the University of the Philippines. Mr. Benjamin R. Sta. Catalina, Jr. was first appointed as an Independent Director of the Board on July 2012 and was last re-elected as Independent Director on May 26, 2017. He has been an independent director at PBB from 2003 to 2005. In the academic sphere, he was the Executive Director of the Center for Banking and Financial Management of the Asian Institute of Management in 1996. Mr. Sta. Catalina is a graduate of the Asian Institute of Management with a post graduate degree of Masters in Business Management. He obtained a Bachelor of Science degree in Management Engineering from the Ateneo De Manila University.